So declared Jules Michelet, a 19th-century French historian, and if there are any doubts about which woman’s heart he had in mind, you have probably not attended much of late by Odyssey Opera. This inventive Boston-based company has dedicated its entire season to musical representations of the seemingly ageless French mystic and martyr Joan of Arc. A French-born composer of Swiss parentage, Honegger wrote his “dramatic oratorio,” with a libretto by Paul Claudel, during the turbulent decades of the 1930s. And a prologue added in November 1944 underscored the linkage between two dark eras in France’s history. The libretto itself presents moments from the heroine’s life in a series of flashbacks returning to her in the moments before her burning at the stake. Joan of Arc, cast as a speaking role, is often alone onstage or interacting with the memories of her past, including the spectacle of her trial, savagely parodied through the use of animals. Honegger’s music is a haunting mix of styles and moods, by turns austere and solemn, deeply spiritual, and bitterly ironic. There are nods to jazz and to the foxtrot, velvety saxophones bring a sensual coloring to the traditional orchestra, and the ghostly tones of the ondes martenot, an electronic instrument, provide an otherworldly sheen. But overall the music manages to be at once suavely refined and highly dramatic. 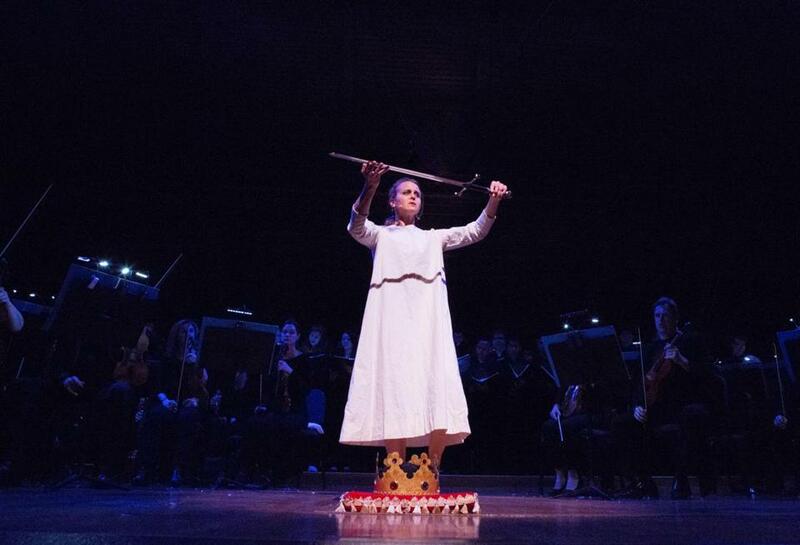 At Saturday’s Odyssey performance, which used an English-language translation by Dennis Arundell, the score’s combination of fervor and sincerity came through. Most of the action unfolded within a large triangular portion of the stage, surrounded by the orchestra and chorus. Featured in the title role was the dancer Shura Baryshnikov, who gave a moving and nuanced performance, sensitive throughout yet building in intensity toward the oratorio’s riveting closing pages, during which Joan hears the voices of her personal saints, is engulfed in flames, and slowly takes her leave of this world. She was surrounded by a strong ensemble cast, including here the tenor Frank Kelley, proudly porcine in the role of Porcus, and Brandon Green as Brother Dominic. Guiding Joan on her way were the strikingly pure-toned voices of Erica Petrocelli as the Holy Virgin, Sara Womble as St. Margaret and Katherine Growdon as St. Catherine. The staging also made dramatic use of Sanders Theatre’s multiple levels, with vocal soloists calling to Joan out of the darkness from various points around the hall. But it is the chorus that forms this work’s spiritual heart, and in Saturday’s account, Odyssey artistic director Gil Rose drew coolly beautiful singing from the well-prepared forces of the Odyssey Opera Chorus, the Harvard-Radcliffe Collegium Musicum, and the Premier Choir of the Boston Children’s Chorus. Overall it was another strong outing for this young company, and an instant highlight of its audaciously conceived current season.